I need your help! I am considering any of the following for a new banner for Polly-Vous Francais? Do you like any (if so, which) or none? Other thoughts in general on color scheme. Font. Or forget the whole concept? I hate design decisions. I LOVE design decisions. Wow. Here I am, six whole years old, and ready to down the champagne. Yup, six years ago today Polly-Vous Francais? was born. It happened by accident, really. I had been living in Paris for two months on place de la Madeleine, invading and soaking up the cultural and political life of Paris. Then I found my dream apartment in the 7e arrondissement. The student protests were all the news, and I was madly sending missives to all my friends detailing the drama and social thrill of my new Parisian existence. Then, over dinner in Paris, my good friend A. said, "Polly, you really must stop sending all these stories in emails." "Oh," I apologized, abashed. "Are they tedious?" "No, not at all -- but they need to be published on line instead, " she said. "You need to start a blog." "But, but... I don't know the first thing about blogging!" I think I whined a fair bit, feeling technologically incompetent and ancient. "Look, Polly," said A., all no-nonsense. "If you... did have a blog, what would you call it?" (Ah, a question I knew how to answer!) "Polly-Vous Francais!" I said, maybe a bit too excitedly. It had been my mantra ever since I understood my first French phrase. We finished our dinner and our wine and parted ways for the evening. 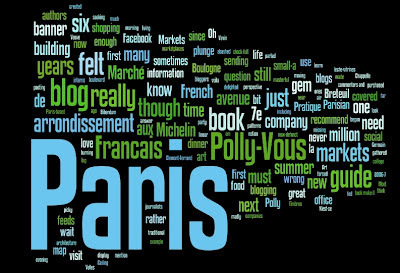 The next morning, an email from A. appeared in my in-box: "Polly-Vous Francais? is up and running. Start posting!" She had created the blog for me. I felt the wind knocked out of me. It was like the time that the summer lifeguard/swimming coach forced me to jump off the high-dive. You can do it, you can do it. Just plunge, just plunge. Breathe later. Polly-Vous Francais? has grown and morphed over the years, from A. 's great banner above, to a few variations. Another Polly-Vous Francais banner, made with stamps from the Marché aux timbres. Back in 2006, many of us bloggers in Paris felt as though we had a mission, but sometimes we felt misunderstood. 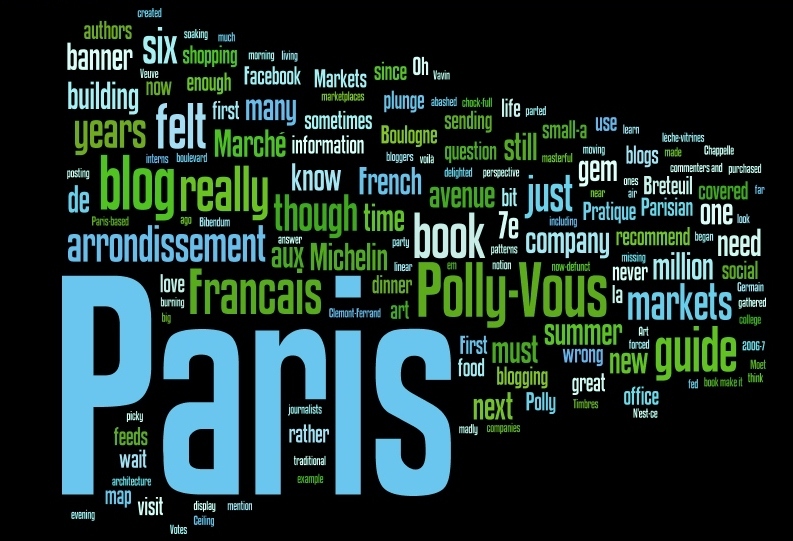 We wrote for the Paris Blog (many lucky ones, still in Paris, still do). We fed our feeds to the now-defunct Paris Times. We gathered to celebrate our blogging life in Paris. Sometimes I felt as though I were part of a new literary genre scene, and sometimes I felt as though it was just considered clown school. 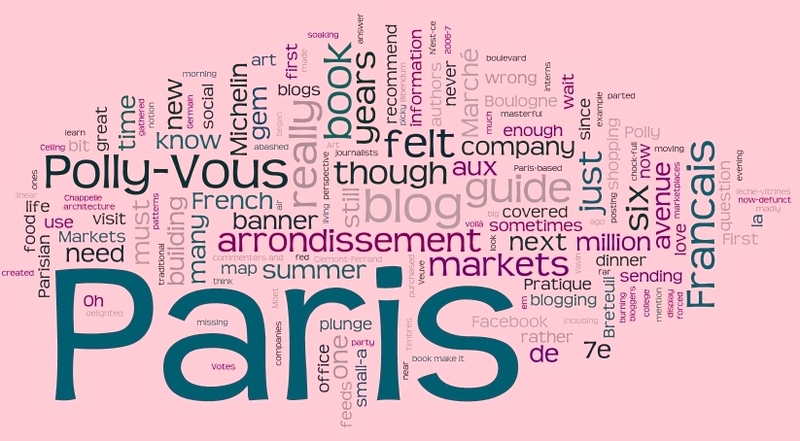 I am really, really delighted to note that some of the official traditional Paris-based print journalists who had pooh-poohed the very notion of blogs back in 2006-7 are now the proud authors of blogs, Twitter feeds and Pinterest and Facebook pages. They have hired their social media interns!! Kudos -- now we're all family. I look forward to returning to Paris this summer to re-connect a) with my inner Polly-Vous, and b) with a lot of pals! Time for a party. And to say that I love you all! And tonight I nod off to bed, having blown out the six candles for my blog. And the next burning question: is it time for a new banner? What do you recommend? Votes? Paris is a constant kaleidoscope. Of course there is the magnificence of the 'capital-a' Art, grand architecture, and masterful sculpture; but there is also the adrenaline rush of people-watching, le lèche-vitrines (window shopping), patterns, and 'small-a' art everywhere. In homage to small-a Parisian art, here are more Paris Patterns. This time more linear, angular. 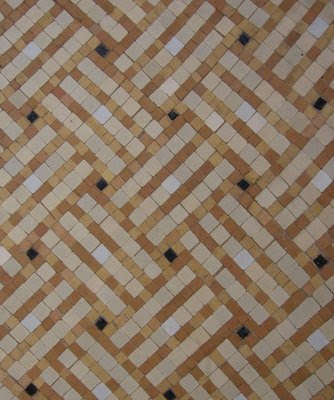 Lattice-weave mosaics on a doorway of a residence near Vavin in the 6e arrondissement. 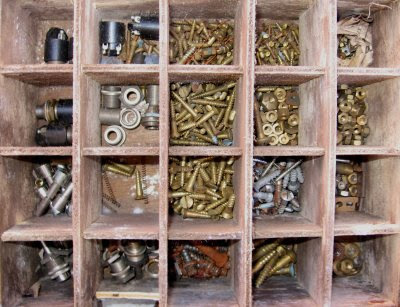 Screws and nails on display at the Marché aux puces at Vanves. 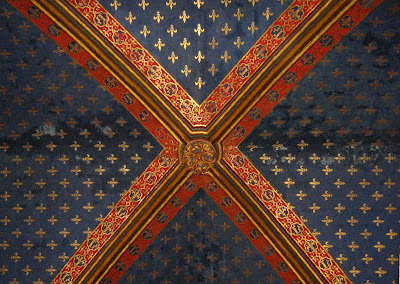 Ceiling at the Sainte Chappelle. Exterior mosaic of a café on boulevard St. Germain in the 7e. 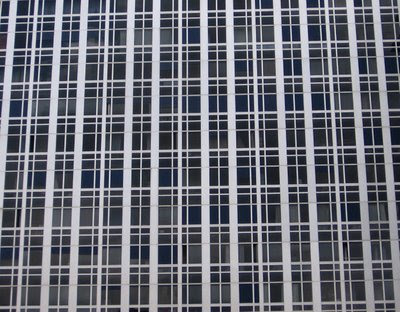 Windows of an office building at Montparnasse. There are SOO many guide books to Paris. We've seen 'em all. N'est-ce pas? 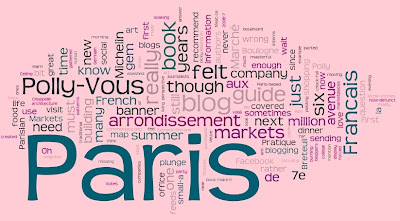 So when I picked up Markets of Paris, in my jaded I-already-know-Paris frame of mind, I didn't have great expectations. Boy, was I wrong! Capital-W wrong. This is a gem of a guide to Paris. First of all, it is organized in the way that any guide to Paris should be, which is by arrondissement. Second, it is more than just a guide to the open air food markets in Paris, but rather includes all shopping centers that you could want to visit, from la Grande Epicerie to the Marché aux Timbres and exquisite covered marketplaces such as Galerie Vivienne, and all my other favorite passages couverts. Oh, did I mention that it is a gem? For example, rather than try to have the book serve as a map, the authors recommend the best map book, Paris Pratique, to use in conjunction with the book. So true! I never have been able to properly navigate Paris without a couple of handy guides: one is never enough. And, at about 6 by 6 inches, Markets of Paris is petite enough to carry in your bag, but chock-full of information to keep you busy reading while you wait for the RATP bus to take you to your next destination. It's a big book in a little book's hide. This and Paris Pratique are all you need. 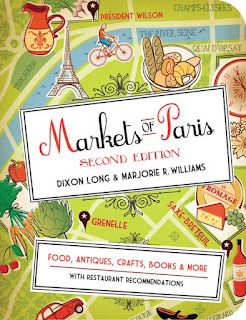 The book has so much practical information, including even a list of "Helpful Books, Blogs, and Websites" to visit to enrich your Paris market experience -- all of which I heartily endorse. From small organic food markets to popular flea markets, bargains to luxe, the markets and material covered in this book make it a definite keeper. I can't wait to return to Paris this summer and use it as my guide.